The last two weeks have been filled with fun and a lot of performances! The 26th of January featured a great night of chamber music! All the students performed great and we were excited to see so many of our band families and alumni out to show their support! On Saturday, February 3rd, both jazz ensemble and jazz orchestra had the opportunity to work with famous jazz educator and performer Dan Cavanagh (Mr. Cavanagh is the head of the music department at UTA and a jazz pianist). After a long morning of rigorous rehearsing, they put their work to the test at the Keller Health and Wellness Fair at KCAL! Coming up next is our solo contest on February 24th! Students will have the chance to compete for OUTSTANDING SOLOIST and will be judged by one of five incredible music educators! Piano rehearsals are coming up so make sure you're ready! Another great week for the Hillwood and Parkwood Hill bands! Our Hillwood bands are hard at work on their UIL music! Each band will perform three pieces for a group of judges in March and April! This is a big part of our year, so be sure to follow us here for updates on upcoming performances! This Friday is our chamber music concert! Chamber music is all about small groups (3 - 6 players) and each of our bands have been working hard since December to put this concert on! All groups performed last week for the class as they prepare for the big day! The concert starts at 6:30 PM in the HMS band hall, choir room, and cafeteria! We hope to see you there! 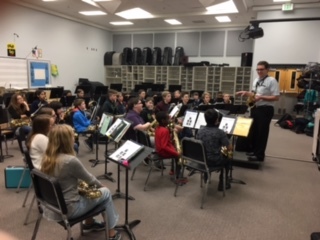 On Friday, Vandoren artist Dr. Scott Campbell came to visit our saxophone students, giving them some saxophone swag and information on what Vandoren is up to these days! Afterwards, he worked with our Jazz Ensemble as they prepare for the UTA Jazz Festival! Welcome back to school everyone! 2018 is already off to a great start with with our 7th grade all-district clinic and concert! We had 20 students earn a spot in this ensemble and we are super proud of the performance they put on Friday night! Thank you for representing Hillwood Band! Parents on being in Band! 1. BAND YOGURT NIGHT – Wednesday, August 31 from 5 pm – 8 pm. TCBY on North Tarrant. Say that you are with the HMS band and receive a 25% discount PLUS the band will receive 20% donation. Be sure to invite the whole family and ALL of your friends! 3. PRIVATE LESSONS – Our private lessons staff are currently filling up their available time! Sign up NOW at www.parkwoodhillwood.band to receive a more convenient lesson time! This is a great way to get some ONE ON ONE time with a PROFESSIONAL who plays that instrument and GET AHEAD ON REGION MUSIC AND SOLOS. Visit the PRIVATE LESSONS sections under the PARENTS tab. 4. SECTIONALS BEGIN THIS WEEK FOR WIND ENSEMBLE AND SYMPHONIC BAND - Morning sectionals – students should be at the front door NO LATER than 7:05 am. Afternoon sectionals will conclude at 4:50. Sectionals are a required part of our curriculum. Absences will result in a failing grade in the grade book and students cannot reschedule. For those of you in athletics, you will be excused from ONE PRACTICE A WEEK to attend your sectional. Please look at attachment for our band calendar and the sectional schedule. 5. CHECK OUT OUR NEW WEBSITE – parkwoodhillwood.band. You will be able to find information about our band, see our calendar, fill out forms, and sign up for lessons. 6. JAZZ BAND— Jazz band is about to get underway, so sign up for an audition time!! Wind players may sign up for times on Monday – Wednesday; Rhythm section may sign up on Thursday or Friday (drums, percussion, guitar, bass guitar, piano). There will be two group traditional jazz ensembles and possibly a jazz collective (open to anyone). Auditions will be this coming week with Mr. Woodrow. Be prepared with scales; there will also be a small sight reading excerpt. 7. FORMS – ALL student forms are due by NEXT FRIDAY. Students MUST have forms completed to participate in some of our activities throughout the year. Visit the FORMS page under the PARENTS tab at www.parkwoodhillwood.band to fill these out. 8. PLEASE COME TO CLASS WITH ALL REQUIRED MATERIALS NEXT WEEK! Hillwood Middle School Band Procedures! Check out the following video for important information on how to be AWESOME during your band class at HMS!